How cool was that invisibility cloak in the first Harry Potter movie? It was simply marvelous seeing Harry's head bob around without his body. Even Dumbledore thought it was the best of the three deathly hallows. Now, imagine what it would be like to have your own invisibility cloak? Physicists have been working on the idea for a while, but recent breakthroughs at Rochester university make it seem like the dream may not be so far away from becoming a reality. Earlier physicists tried to bend light around the object they wished to cloak, to render it invisible. But this led to certain distortions, that made the presence of a cloaking device evident. However a team at Rochester university has approached the problem in a different way. Instead of forcing light to bend around the object, they take a picture of the background, and place it in front of the object to be cloaked, so what you see is the background missing the object completely. The trick has to be cleverly executed, so that the eye is properly fooled, no matter which direction the object is viewed from. The background imaging must also be dynamic, so the cloaking technique can adapt to the changing background as the object moves. By the way Harry Potter wasn't the only popular fiction to mention a cloak. Remember the cloaking devices used by the Klingon Bird-of-Prey and the Romulan Warbird on Star Trek? 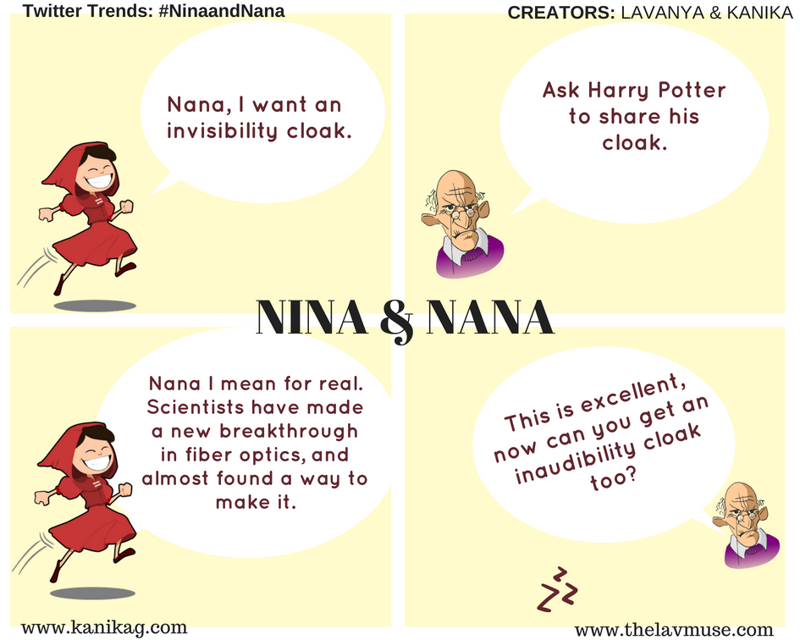 But Nana doesn't think an invisibility cloak is good enough. See what he has to say when he learns about it from Nina. Haven't you heard of noise canceling headphones Nana? This youtube video explains the Rochester cloaking experiment.